Whether a river has high or low water levels is something you’re unlikely to consider when planning your river cruise – until it happens to you. Unlike ocean cruising, river cruising is all about narrow margins. Low bridges make the air draft of a ship – how much of it sticks out of the water – critically important. Most river cruise ships have collapsible upper deck railings, removable furniture, and even navigation bridges that lower completely into the floor. What’s under the keel – or hull – of your river cruise ship also makes a difference. In some cases, there can be less than a foot of water under the keel. River cruise ships have incredibly shallow drafts to begin with, and river cruise operators construct their ships as efficiently as possible. They’re the high-performance sports cars of the cruising world. Unfortunately, low water and high water conditions can exist – and they can throw a real wrench into an otherwise flawless cruise. 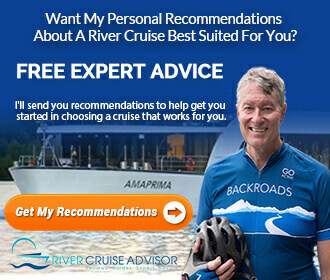 For current updates from river cruisers currently on the rivers (or from those who have returned recently) be sure to see the comments at the bottom of this post. The Rhine is perhaps the most dependable river when it comes to being able to continue navigation due to low water. I felt the boat scraping the bottom of the Rhine in Rudesheim in November of 2015, but we made it past. See Is AmaWaterways The Champion Of Low Water? Water levels are unpredictable. In many cases, the cruise line may only find out on your actual sailing, or a few days beforehand, that a particular stretch of water isn’t navigable. Water levels aren’t uniform. That is to say, if there’s low water on the Danube, the entire Danube isn’t affected. In 2014, water levels were too low for many ships to pass between the German cities of Passau and Regensburg. In past years, the stretch heading across the Austria-Hungary border has been problematic. History isn’t a good indicator of high or low water. In June of 2013, Passau was hit by the worst flooding – and the highest water levels – since the Middle Ages. In 2018, the Danube was so low that many cruise ships terminated their journeys in Passau. Continue the affected itinerary by having guests ‘swap ships’ – typically, being bussed from one town to the next, where you will embark a sister-ship or similar vessel to continue the rest of your journey. Read about our ship swap on Viking. Complete the itinerary as far as possible aboard your ship, and then transition to hotels (on the company’s expense) to complete the remainder of your itinerary. Outright cancellation. This is the rarest option, exercised when no other options are available. I’m not sure if I should cancel my river cruise because of high/low water levels. What do I do? Unless you have travel insurance that covers cancellation, do not cancel your river cruise over high/low water. Wait for the cruise line to either pull the plug or offer alternatives. If your sailing commences in a few weeks, cancelling your sailing will result in you loosing all monies paid. If you wait for the cruise line to pull the plug, offers typically include the ability to switch to another sailing at no cost; the offer to complete your cruise as scheduled at a discount or rebate; or the offer to cancel with minimal or no penalties. Of course, such offers are determined by the cruise line, but typically favor the guest. Curious as to what the current conditions on the rivers of Europe are? River Cruise Info purports to monitor river levels, but we question the accuracy of the levels being reported. The site appears to be broken. At any rate, the tables should be used as a guideline only, and only indicate if water is running low or high – it may not have any bearing on whether itineraries are about to be affected or not. To see what our readers had to say about how their trips were impacted by low water levels, click here. I went on a Christmas Markets of the Rhine River in December, 2018 with Grand Circle starting on the M/S Melody. Water level on the Rhine was too low for our ship to sail through the gorge, so Grand Circle gave us the optional Heidelberg full day tour including lunch for free while we swapped ships to the Rhapsody. We were bused to some of the markets, but Grand Circle gave us lunch money so we didn’t have to return to the ship until dinner time. I was very happy with the Program Director and Boston Office solution, and they also gave us a credit on a future trip as an apology. All in all a very good solution to the problem. Thanks Grand Circle! Thanks for sharing this Lynn. Sounds like Grand Circle handled it really well. I am leaving for my first River Cruise on AMA May 19, 2019 from Passau to Budapest. Hoping for good water levels. 🤞🏼. It’s a wine cruise so regardless of high or low levels in the river, we plan to enjoy ourselves! 🍷. Cheers! I sailed GCT and we sailed two day on The Great River trip. Sat at dock for four days. No ship transfer. Other ship at dock with Viking was making swap. Does anyone know which cruise lines offer ship swap? I don’t want to sit at dock for days again! We are doing Basil to Amsterdam Viking in 3 weeks. Updated water levels – anyone? We just finished a Viking river cruise from Amsterdam to Basel and water levels were perfect. The weather could have been a little warmer but other than that, the trip was everything we hoped it would be. We have booked a Viking Budapest to Amsterdam cruise for May 2020. From all of you experienced cruisers out there…..should we be concerned about water levels in the month of May? Thanks. 2017 we did that trip on Viking. A couple times getting under a bridge was very close due to rains raising the water level. Otherwise, the trip went well. We were told when we arrived in Amsterdam in a downpour of rain that we did the trip in the best direction. The weather tends to go towards Budapest from Holland. The people about to embark would probably have the rain stay with them a while. Our friends did an Amsterdam to Budapest trip in June a few years ago with Viking. They had to change ships at Passau with the sister ship travelling in the opposite direction because they couldn’t get under the bridge, due to high water levels. They said it was no problem, packing their bags in the morning, leaving them in their rooms for the staff to handle. They went on their scheduled excursion and returned to the other ship where they found their luggage in the same numbered room, just had to unpack. To me it seems to be the luck of the draw……I have my fingers crossed that our postoned trip for December 2019 goes ahead. Good luck, all seems fine at the moment. We travelled with Scenic River Cruises Oct 2013 from Amsterdam to Budapest and had no trouble at all, the rivers were fine. We are now about to embark on another Scenic River Cruise departing 12 June 2019 fro Nuremberg to Budapest, so am hopeful the rivers will a gain be fine, sounds like levels may be returninf to being okay? Any updated information would be greatly appreciated. Thank you. We’d also like to hear how the water levels are during your June voyage if you wouldn’t mind letting us know. I will email you my info but you can also post here. We have a Viking Budapest to Amsterdam planned for May 2020. Should we be concerned about water levels in the month of May? We are taking a Viking river cruise Amsterdam-Budapestat at the end of May; how can I find out the river water levels. I understand by the comments, that Viking does not do anything until a couple of days before the trip. Not an encouraging feeling. You can’t find out about future water levels. Water levels are subject to change. Right now they’re good, but no one can predict. Insure your trip. Insurance fine print is scary. Water level insurance is iffy. They won’t cancel the trip when they can offer bussing options so the insurance companies don’t see the trip as cancelled because it is not. Any advice on how to get effective insurance that might actually pay out would be very helpful. Thanks. Our trip in October from Amsterdam to Basel was also interrupted with a switch in ships. We found out just a week or so before our trip but know that it was not the fault of the cruise line. All cruise lines had the same issue. Viking could not have done a better job keeping us entertained during the swap. They booked an entire restaurant for our lunch and it was wonderful. They even booked a small riverboat cruise with lunch included so we could still see the castles in Germany. When we met up with our new ship there was a lady outside with warm fragrant towels to wipe our hands/faces. Inside the ship the crew was ringing bells, cheering and holding up “Welcome Home” signs. It was our first Viking cruise and we were very impressed with every aspect of the trip. Thank you for Yr comments. Hubby & I are booked in with Vikkings, Budapest to Amsterdam in August. Reassuring that Vikkings looked after their passengers in low tide conditions. My husband and I are also going in August. Very concerned about water levels simply because I don’t do well on buses. Good attitude Don. Thanks for sharing! If you get that email 2-3 days before departure, I would cancel. We took a Viking cruise in October, 2018 Swiss Alps to Paris and it was terrible. Up early every morning to get on bus, then hours on end to destination, a quick tour then back on bus to docked boat in time for late dinner. Some days as long as 10.5 hours. Repeat next day. Those who paid extra for veranda and balcony rooms, and those who paid for expensive beverage packages were out of luck. Viking would not reimburse them even though there was no time on ship except to eat and sleep. We were totally exhausted and physically sick by the time we got home. Viking reimbursed us $500 of a $10K cruise. Did you have the trip insurance in order to get that refund? Booking a European river cruise is like going to a casino and putting all your money on 1 number on the roulette wheel 6 months to a year before they spin the wheel! No one can predict what the water levels will be so don’t worry about it. The major cruise companies deal fairly well with water level issues. A river cruise traveler MUST be flexible and adaptable. I have done 5 cruises in 12 years. 3 had to be modified due to water levels. I repeat. Don’t worry just enjoy your trip ad it evolves. Anyone have any updated information on the Rhine River water levels between Amsterdam and Basel Switzerland? Our trip is coming up in early April and wanted to know current conditions? Current conditions are perfect. I’ve spoken with reps in Europe last week. Following up on the Rhine river cruise we did with Viking April 7-14. The water levels were fantastic as was the cruise. We thoroughly enjoyed the experience! Hope the water levels continue to remain perfect for the year. We have been on a number of river boat cruises with one cancelled trip this past October due to low rivers. Can we bet that ealier in the year gives us good chance of clear cruising? What we know is that the rivers are at normal levels now. It’s impossible to predict. But we have reports from our contacts on the ground in Europe and things are good now. Went thru all comments. All but two referenced Danube, Rhine, etc. Any comments on spring cruises on the Rhône? More concerned with high water level issues due to rain and snow melt. Ditto, Chris! High is fine but low scares me. Has the winter snow been enough to replenish the summer drought and low levels of the Rhine? I am taking the Emerald Christmas Cruise in December 2019 – Budapest to Amsterdam- can anyone tell me if their Christmas Cruises were interrupted by low water levels in December 2018? I do not know about Emerald and 2018, but my Viking cruise was briefly interrupted during a Christmas Markets cruise a few years ago. There was a bridge that we could not get under but we waited it out and eventually proceeded. We are on Riviera cruise from Budapest to the Black Sea in 10 days time and I’m wondering how the Danube is on that stretch of the river. We took an Amawaterways cruise in early November 2017 from Budapest to Vilshofen and had no problems. I realize it’s a year off your requested timeline but thought it may be a data point for you. Thanks for letting us know too! We cruised with Viking, Rhine, November -Dec 2018, Christmas Markets Cruise. The Rhine was very low, we had to transfer ships day two of the cruise. We also missed 3 city stops and spent a lot of time on buses. Not ideal. Viking offered a small compensation, but it wasn’t commensurate with the issues that we experienced. We took a river cruise the end of November 2018 on the Danube and had to transfer twice to another ship due to low water levels. The first time was not a big deal, 45 minute drive but the second time it was a few hours drive. Because of the long drive, most optional excursions were cancelled in Budapest. What portion of the river were you on and in which direction? Hi Gary, We booked APT Amsterdam-Budapest cruise for December 2018 which didn’t go ahead as planned due to low water levels in both the Rhine & Danube rivers. We were offered and alternate cruise of The Netherlands & Belgium with a flight to Vienna & bus to Budapest OR Refund OR rebooking for 2019 and 2018 prices. We chose to rebook for 6 December 2019 and are hoping the water levels won’t be too low two years running. We couldn’t however cancel any other travel, on insurance (without penalty) as they had offered and alternative. We chose to travel Amsterdam to Zurich, do a tour of Switzerland with Insight which was magical in the snow, fly to Vienna and train to Budapest. It turned out to be a wonderful trip and we are looking forward to our cruise of the Rhine Valley & train trip to Salzburg 2019. I am currently looking for reviews for an upcoming 2020 river cruise to Africa. I like this site for its objective and balanced view. I ran across another review site that seems to have many reviews about the water level problems in December of 2018, so that may be helpful. In reading the comments, my takeaways are the lack of transparency & communication to passengers before, during and after the cruise. Also, compensation seems lacking when due and not as promised, regardless of travel insurance purchased. Keep in mind that the small number of reviews compared to the large number of travelers means that folks already dissatisfied have found a place to vent. I wouldn’t necessarily throw the baby out with the bathwater, as the saying goes. The cruise lines can’t control the water levels, of course, but they don’t seem to have a good backup plan when things go awry. We did one cruise on the Danube from Budapest to Vilshofen with Amawaterways in Nov. 2017 and had a fabulous experience; we just returned from the Mekong with Ama, as well. We are now looking at South Africa; not sure if we’ll do a river cruise since they only offer 3 and 4 nights, then the rest is a land package, so we may just do a land package. I’m still looking into customer satisfaction with land tour companies; objective reviews are difficult to find. Good luck on your trip; the best advice I can offer is research, research, research. We did a Christmas Market Cruise in November-December 2018 from Budapest to Amsterdam. The ship was unable to make in to Budapest which resulted in going by bus to Vienna and missing four ports of call in Bratislava, and Austria. Our ship was in Regensburg where we boarded on Day 3 and ended up doing two German ports twice. Certainly not ideal but we talked to many people on different cruises that were in the same “boat”. During the cruise it came to light that these particularly low spots had been too low to cruise for a lengthy amount of time leading up to our cruise. The cruise company we we used confirmed (after the cruise) that they were banking on rain that never materialized and that was why they did not inform passengers earlier. I have asked the company we cruised with: When they were last able to successfully cruise the low areas we encountered. They avoided answering. Is this communication with passengers reflective of the river cruise industry as a whole? What are questions a first time consumer should research or ask in order to find a company that is reputable in the industry. Or is this relatively standard procedure when it comes to the river cruise industry. We’re back and it was fabulous. Sailed the Amaserena the entire itinerary from Nuremberg to Budapest. Yay! Super thx Captain Christian. 12/10/18 We are able to sail from Heidelberg to Cologne on Viking. Cruise staff said it’s the first time in 4 months they’ve been able to make it down the river this far. After uncertain initial few days, we are very happy for the rain and no disruption in our Rhine river cruise! Sailed on Viking from Passau to Budapest on 11/29. There was rain in Vienna (raising the Danube just enough) and our cruise was not interrupted. Our cruise was fabulous from beginning to end. Update (December 4th, 2018): We are very happy to report that with the recent rainfall in Europe, the water levels on the Rhine and Danube have risen dramatically over the past few days. We anticipate returning to scheduled itineraries for all cruises embarking December 7th onward*. Heart-felt thanks to all our travel partners and guests for their patience and understanding and our remarkable onboard crews who continued throughout this period of low water to deliver an exceptional vacation experience for our guests. That is such a relief to hear! Does anyone know what month the low water levels became an issue this year on the eastern stretch of the Danube? Trying to plan for next year. When water levels are “low” cruising requires ship swaps . In our case we were on 3 boats. Earlier in the season some cruises required 4 and 5 ship swaps. ***same low spots apply but reverse order. I have listed low spots of one was starting in Nuremberg ending in Budapest. Approximately 4 hour bus route. Sherri we were on Viking in Early August from Budapest to Amsterdam and we were told we would have 1 ship swap, that happened as did numerous bus drives lasting 5 -6 hours and we missed 4 towns. For 2019, I suggest looking at river levels in the early part of the season due to the high snow falls in Germany. Flooding could present issues too. Good luck! Currently on Danube with Riviera cruises. Moored in Budapest and going nowhere. We’ve booked the Danube for May of 2019, in ll your wisdom, that can you predict? We booked Ama Watetways on the Danube in April 2019 🙂 Does anyone out there have good news? Anybody currently sailing with Viking on the Rhine Getaway, Basel to Amsterdam? How are water levels affecting the cruise? As of yesterday, no interruptions! Happy to report lots of rain and first time the ship can make it through to Cologne. Contrary to popular belief, ones river cruise WILL be significantly impacted due to extreme water level fluctuations. The main reason people want to spend big bucks on a river cruise is to actually be on the river. If the river cruise ship is significantly impacted either by high or low water levels then buses will be utilized. Bus trips would be my very last choice for a vacation. The river cruise company should significantly reimburse the vacationers for the inconvenience, or notify the vacationers before the trip with money refunded, or applied to a different date. Question, Is this a novel idea?? PS (post script). One of our friends did experience the bus trip nightmare. Actually they did get one day on the river only the cruise ship ran into a bridge with all passengers on board. I cruised the Danube in early Oct. with Viking, and our trip was impacted by low water, although not as badly as some earlier cruises. And no, your suggestion isn’t a novel one, but it’s certainly not anything you’re going to get from Viking. The only thing they offered was 25% off our NEXT cruise! And although the water level had been an issue since at least August, they waited until 3 days before the cruise to let us know there MIGHT be an impact, and then told us the day before that there would be. Other cruise lines were more timely and generous in how they handled the situation. We cruised in early August and we were told water levels were an issue in July. All up, lies, deception and bus trips, certainly not a river cruise we were expecting. No reasonable notice or information provided before or after the cruise. Had you been reading social media pages, you’d have known the mid and late September Viking cruises were canceled altogether. While there were some cabins on Oct/Nov cruises, they wouldn’t even let us change to those. We leave soon for another try at a river cruise. In a bit of GOOD news, it would appear that AMA is operating scheduled itineraries. I got communication from both my travel agent and an AMA rep. My eDocs were received this morning too. I was told that there is no anticipated change and that my sailing (Dec 14th Nuremburg to Budapest) on the AMASerena is still set to go as per original plan. Hopeful. See my reply below to Nancy Gibson. This is a German government river depth guide-You will be bussed more than you will be on the river cruising! I did the Danube Waltz cruise on Oct. 9th, and like you, only received notice about this right before leaving. We spent the first night on a different ship, then the next day got bussed 4 hours to Vienna where our boat was, which meant our afternoon excursion in Budapest was canceled. To do our Bratislava tour meant a 1-1/2 hour bus trip. From Vienna our itinerary was as scheduled. Not sure how the water levels are now, but I can tell you that Viking has not been as good about handling this with regard to compensation and notice as some of the other lines. I have a question for all those who has the bus replacement due to low waters: what did you do about laundry? We are doing the Christmas Rhine cruise soon and are traveling with our young daughter. I loathe spending excessive money on hotel laundry services (we recently had to pay $100 USD at the Four Seasons!) and after reading all these comments, it doesn’t look like onboard laundry will be an option. I want to pack as light as possible in the event we have to truck our luggage back and forth from bus to hotel but in doing so, it means we need to have laundry facilities somewhere, At least once. Any suggestions would be appreciated! I will be sailing December 14-21 from Budapest to Nuremberg on the Danube for a Christmas cruise. I am getting so nervous. I was never notified by AMA until I went into the booking and saw the low water level notification. I have no idea what to expect. I have been reading horror stories with regard to bussing people, staying at multiple hotels, not even cruising…. Has anybody been redirected? Are you still sailing? We are booked on the November 30 trip from Budapest to Nuremberg on the AmaViola. We received a “low water level” notification from Ama on November 14, and are awaiting final notification as to which itinerary we’ll be on. According to the letter we received, if they have to alter the itinerary due to water levels, we will sail from Budapest to Vilshofen, with an extra night in Vienna. It does not appear that there will be any ship changes or bussing, other than the transfer from Vilshofen to Nuremberg. I’ve heard the same thing. My agent called as well and we were told the office was affected given the California wildfires but they will be sending electronic documents. I am crossing my fingers for more rain. We still have two weeks! Yes. I feel badly about the fire and concern for the staff and loved ones affected but surely they are able to operate out of an alternate location. It is 11 sleeps until we leave and not a word from AMA. water levels are to low for this trip. Looks like a trip round Holland and Belgium . As the same as last week for the AmaPrima & Amakristina. @ George – Looks like we’re embarking as you’re disembarking. Is there a sample itinerary for the “trip round Holland and Belgium” you’re referring to? I’ve heard NOTHING from Amawaterways yet! < 2 weeks. Waiting for my travel agent to get back from her own river cruise (Bangkok) and get me some sort of update. 1 fly to Basel train to Cologne to join ship . 2 fly to Basel train to Zurich and fly to Amsterdam. I am following the AmaPrima on Cruise mapper.com and at the moment it is in Cologne .will be able to let know which way it is going tonight when it leaves . Glad to hear things are moving! 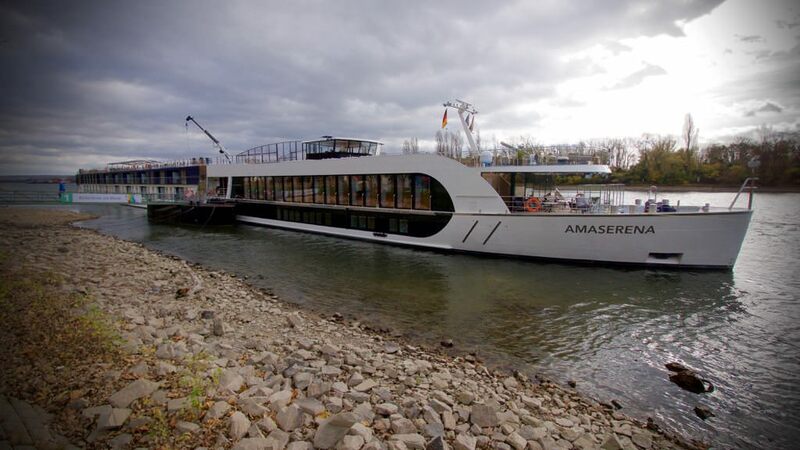 Are you seeing other passengers ships (as large as yours) on the Rhine? I’m using an App to track ships on the Rhine as we are joining the AmaPrima on the 8thDec in Basel , but we’re told last week that it would be a different voyage as the Rhine Gorge was suffering from low water,it would appear the rain of the last few days has improved conditions. Noted a couple Viking Ships have also managed to get through the Gorge. Hope this helps . At 16:00 Amsterdam bound . Thanks for the update and enjoy your cruise! Got my travel docs last night. So far no changes in itinerary. According Weather.com they’re finally getting rain, so…? Just looked at Cruisemapper (great idea, George – why didn’t I think of it!) and AmaPrima is just north of Speyer. Seems to be quite a few ships all up & down the Rhine. Glad to hear your news ,we have been on the AmaPrima before and have sailed with Ama 4 times previously,they are a great company and look after the clients very well. Nice to hear from someone (a repeat passenger even!) who’s been on Amaprima. We’ve done several ocean cruises over the years, but this is our first river cruise. Thanks for all the comments. Will watch for your postings on your trip next week. Bon Voyage! Promising news! Thanks for the update. My travel agent (who was out of the country until yesterday) says she receieved my travel docs from Ama and wants to set a meeting – I assume to communicate any route changes. Hoping to get with her today. Confirming trip from Basel to Amsterdam as Rhine Gorge now passable. We are doing the AMA cruise the same dates but reverse direction. It is now less than two weeks out and we still have no travel documents. We are getting antsy. But I spoke with my travel agent who has been in communication with AMA. Apparently Nuremburg is the problem and the cruise line may have to use Vilshoven (sp?) instead with an extra night in Vienna. It will mean missing Nuremburg and the holiday market but we are hoping this would be the extent of changes. Remember though Beth, as indicated above, AMA ships require less draft to operate. Fingers crossed. Beth, I just got communication from AMA that my Dec 14th sailing (Nuremburg to Budapest) is going ahead with no anticipated disruptions as of today. German river depth guide You will be bussed! We are scheduled for Viking River Cruise from Passau to Budapest leaving December 5, 2018. Are any ships sailing on the Danube? Thanks. The email goes on to read that we will be given a 25% off voucher for a future cruise. Hope this helps. Not the worst case and the drives should be beautiful.. Thanks Sheri, it sure could be worse. Enjoy your cruise. It sure could be worse. Enjoy your cruise. This sounds like exactly what happened on my Oct. 9th cruise, just in the opposite direction. Just one caveat–the drive between Vienna and Budapest, which took about 4 hours, was anything but beautiful(I had hoped we’d at least get to see some of the countryside)–it was all on a major highway like any American interstate. Very boring. Our cruise ended in Budapest uninterrupted and was wonderful. I’m sorry yours was not able to navigate the Danube for the entirety of your cruise. In October 2018, my husband and I took a Viking river cruise to nowhere. Our cruise ship NEVER left the dock because of low water on the Rhine, and now we are fighting with Viking to be fairly reimbursed. We could not board in Basal, so we were bussed to the next port in Speyer, Germany. We had a veranda view of the embankment for 7 days. Every day, we were led to believe the ship would sail the next day. That day never came. Instead we were bussed through Europe on highways to each port city, then bussed back to our ship in Speyer. Round-trip bus rides got longer each day to ports farther and farther away. Round trips went from 4 hours on a bus to 6, 8, and 10 hours on a freaking bus! Our final destination was Paris. We boarded the bus in the morning and arrived there in time for dinner, which counted as one day in Paris. We tried very hard to make the most of what was to be a trip of a lifetime to celebrate our 40th anniversary, including upgrading to the premium drink package. Truth be told, the experience on the bus was miserable and the experience dealing with Viking in the aftermath is miserable. The blame lies with Viking for withholding the truth about water levels so low that cruising wasn’t possible. Bussing is no substitute when you sign up for a river cruise. Shame on Viking. Just wondering–did Viking give you full refund? What about airfare? Were you reimbursed for that if you cancelled? I know they don’t give you the insurance money back. Did you get the insurance through Viking? We are looking at a trip end of October, 2019 from Budapest. Thanks. We are or were doing this trip on December 8th and have been sent alternative arrangements which involve a trip around Holland and Belgium for 11 nights then flying to Vienna and then coaching to Budapest. We are not happy but it is better than nothing. They did say however that they will be watching the water levels in case they get better. We could have waited until next year to do the same for the same price but with no guarantee that next year would be any better we decided to go ahead. Ann, It sounds as though you were travelling with Ama or APT here in Australia. Did you enjoy your cruise through Holland and Belgium or did they cruise Amsterdam to Budapest as planned. Looks as though others may have. We opted to postpone to December 6, 2019. We had to make a quick decision as we were given the itinerary on the Friday, making our alternate plans on the Saturday then left Sydney on the Tuesday. In total 1 weeks notice of disruption. No cancellation of cruise, so no cancellation of airfares without penalty. We had a wonderful trip in Switzerland and are looking forward to our cruise later this year. At the recommendation of “River Cruise Advisor” we chose the Danube for our first river cruise. After reviewing the offerings of the various cruise operators we chose Viking and must say that after all the low river problems we experienced we would again, and already have, booked another Viking cruise! More to follow on that. The synopsis of low water experiences, and more specifically derogatory comments about Viking, that was emailed the other day certainly did not reflect our feelings towards Viking. We were notified by our travel agent a week plus before the departure that there may be problems due to low water. We subsequently received an email from Viking reflecting the same information. While there was a slight increase in the river level during our cruise it was not enough to prevent water levels from impacting the cruise. That being said, we are glad we continued on with the cruise! Comments were made in the email about Viking and refunds, which were dramatically different from our experience. Going in the email we received from Viking prior to departure indicated that there would be a 25% credit towards future cruises. Upon return we received another email that upped that credit to 50%. During the cruise there was some confusion, as would be totally expected under the conditions, but Viking staff went out of their way to accomodate individual needs. While we would have appreciated normal river levels, we enjoyed the time of our lives on the cruise and certainly glad that we went ahead with our planned vacation and thanks again to Ralph for recommending the Danube for our first cruise. Your review makes sense and describes what we were thinking might happen. We are doing the Romantic Danube the end of Oct 2019 and were just talking about strategic packing just in case we have to switch ships or stay in hotels. Fingers crossed that we don’t. Thanks for posting this! Any updates on current conditions on Danube? Scheduled on Viking from Neuremberg to Budapest Dec 8. We received notification from Crystal Cruise Lines of the low water levels. We are scheduled to leave Amsterdam on November 25, 2018. Instead of canceling the cruise they offered an amended itinerary that is NOT comparable to the original. No longer included: Cologne, Koblenz, Rudesheim (Mechanical Music Museum), Speyer (Heidelberg Castle), Breisach (Black Forest), or Basel (Michelin Star Dining) and (Swiss Chocolate Making). We understand the river conditions are beyond their control. We chose Crystal to celebrate our one-year anniversary because of their ‘award winning’ customer service. Since the itinerary changed significantly, we asked for a cash refund, which is being denied. We don’t have the luxury of time to take another cruise in the next two years (and have our money held by Crystal Cruise Lines). It’s hard to believe that consumers have no rights/or protections. We have trip insurance, but it is also being denied because an alternative NON COMPARABLE itinerary is being offered. We are also booked on the same itinerary, Tim and hoping the revised tour does go ahead. Celebrating our 25th anniversary and have others trips scheduled after the cruise. Only hoping they do not cancel it, else we will have to create a new itinerary for those 10 days. We are scheduled to leave for Viking from AMS along rhine. Any more recent updates for those that might have traveled last week? Big disruptions? We were on a Uniworld cruise from AMS to BAS leaving November 5, 2018 and we probably were the only ship that made the complete trip (with a few modifications). All nights were spent on the ship and we sailed through the complete route. Uniworld was fantastic and the week before, they notified us they had switched our ship and crew (Empress to Princess) which had smaller draft but was exactly the same layout. While we did have to sail slower at times which led to earlier embarkation from some ports, and one changed port, all the day tours left and returned to the Princess which at times sailed while we were touring local towns to make up time because of slower speeds. We did get to sail through the Rhine Gorge and see all the castles, even though it was earlier in the day than originally planed. Throughout the cruise we were updated daily on the itinerary. In each town we met people from the other companies who were on bus trips or had ship swaps with days in hotels rather than cruising. This is our seventh river cruise and I learned again why it is so worth it to carefully pick your river cruise company not just by price and brochures. I now know to check on the height and draft of the ship since the water levels can really ruin a great planned trip. Currently on Danube with Uniworld. Travel has been fine between Budapest and Vienna. Destined for Passau. Thanks for info Craig. Is your cruise still on schedule to arrive in Passau? We completed the journey to Passau without schedule disruptions, although I understand at times the water depth was barely passable. Good job by Uniworld. We are scheduled to cruise Passau to Budapest on December 8 with Uniworld. Do you think we will have any schedule disruptions because of water level? Any updates on the Douro for next week? We were scheduled to be on this cruise but after reading about the low water levels etc. we decided to take one of the three options from Crystal to cancel. This was a tough decision as we were really looking forward to this cruise but we were very pleased with Crystal for stepping up with three different options. We are curious on how the cruise is going and would like some feedback from anyone that is on this cruise. Water level 368 CM in Linz tonight. Cruised from Bratislava to Linz without issue. Which ship are you on and how far are you going? Is this site funded/controlled by the cruise lines? Are critical comments being sanitized? Are cruise line employees posting positive comments about their employers? Hi George, Comments are not being sanitized. Cruise line employees, to my knowledge, have not left any comments. I’m sure you’ve read through the comments. Many are very critical. What are you seeing that makes you question the comments? Our take is that people are very disappointed and voicing their disappointment. We did have a system malfunction where 30 comments went to spam – not sure why – but your comment was among those. We discovered the issue and have approved all valid comments that went to spam. I cannot access comments after October 22. Are there any? October 22 is the last that I see (aside from yours). There have been no comments since then. The link to the site that purports to show the currently water levels on European rivers http://rivercruiseinfo.com/content/river-levels is apparently worthless as for weeks it has shown that all water levels are fine. The link to the site showing water levels http://rivercruiseinfo.com/content/river-levels is apparently worthless as for weeks it has been stating that the water levels are fine on all the tracked rivers. Thank you. I believe you are correct. We’ve amended our post to note that the site appears not to be accurate. Our river cruise we are to fly out Friday for has “just pulled the plug” because of low water on the Rhine… wished I had found your website before and not been so shocked tonight. Thank you for the information. Sorry to hear about your cruise. What cruise line were you using. I’m trying to get AMA Waterways to let me cancel my upcoming Rhine river cruise without penalty. So far they won’t even respond. Anyone have information about Amadeus Silver II? We are scheduled to cruise from Amsterdam to Basel starting October 28. We were scheduled on Avalon from Amsterdam to Basel Switzerland this weekend November 27thru October 1, 2018. Avalon just cancelled the cruise. Just returned from a Viking cruise from Amsterdam to Basel that was deviated because of low water levels on the Rhine. The passengers lost about a day and a half from their journey because of packing, unpacking and being bussed to the other ship’s location and a farther bus trip to the port we were to visit. We basically missed the entire Middle Rhine valley with all of the castles. We also missed going to a port because of the change in schedule. According to the crew, there has been no appreciable rain along the Rhine in more than two months and crews have known they were going to deviate. The cruise after ours was going to have to do the same thing. I believe Viking owes us a partial refund. We booked a river cruise, not a bus trip. Viking River Cruises – Romantic Danube – 8 Days Nuremburg to Budapest. The cruise started on Sept 7th in Nuremberg on the Main Danube Canal for 80 km before joining the River Danube at Kelheim. Kelheim to Budapest is 750 km on the river, due to the low water levels we actually only travelled 470 km on the river, mostly at night, thereby being unable to see the scenery. We missed over 37% of the River Danube cruising and had to be coached between Straubing and Ybbs to change ships, a distance of 280km, with only approximately 8 hours daylight cruising centred on the Wachau valley. Guided tours were re-arranged causing less free time in Passau, Vienna and Budapest and also missing several on board features included in the brochure. Notification by Viking a week before departure of ‘possible’ problems due to low water levels and a ‘mid-cruise ship swap’ did not advise the scale of the changes required like missing 37% of the River Danube which I believe should be classified as ‘significant’. Burges, Rotterdam, Ultrech, and Dusseldorf and have has an incredible time. With so many people and a logistic nightmare of scrappi g the 1st tour what Ama waterways has done is short of a miracle. They are an incredible line who have their customers satisfaction truly in mind and have pulled out all the stops to keep us satisfied, informed and happy all along the way on this trip that could have been both a logistical nightmare and real disappointment for everyone. A wonderful time and compensation has been had by all. Thanks for the info. The week after our scheduled cruise on Ama Waterways (leave Amsterdam Nov. 17) is already scheduled and paid for (leaving from Basel to Paris) so an alternate itinerary is not acceptable to us. We did not pay for a bus cruise. Ama Waterways needs to cancel our cruise and give us a full refund. I would contact them immediately to have all your concerns answered and how they will be handling this unfortunate set of circumstances.. Thank you for your advice. We booked through Untours which partners with AMA Waterways. I am writing them an e mail right now. I will post updates. My husband and I were on the same cruise… have you been compensated as promised? We have not. Yes we have received the letter that states the compensation for the trip. We stayed on the trip all the way to Zurich and they were amazing in all of the remaining cruise from Amsterdam when we returned from Cologne and went through different rivers. I have spoken to friends we met on the trip and they received theirs as well. Did you stay on the ship for the entire trip? Yes we stayed on the ship all the way back to Amsterdam…After touring Belgium, etc. They truly amazed us by creating a new river cruise overnight. Then AMA flew us to Basel (original cruise destination), put us up in a very nice hotel all paid for by the company. All connections were on time and escorted us all the way to the gate! We really were pleased with the way AMA handled the situation! The cruise director, Alia, could not have been any better! We will contact them directly to secure compensation..thanks for your help! Leave 10/28 Sunday on Viking sailing Budapest to Amsterdam. Any updates on the Viking ships; are they making it on the rivers or busing / ship swapping. Cannot get any information out of Viking and they currently have multiple ships sailing this week and next! Any info about the Danubue, Mein and Rhine is much appreciated. thank you! Rivers are all LOW! CHECK WITH YOUR TOUR GUIDE..We are still on our cruise that was supposed to be on the Rhine but got rerouted after day 2 because of water levels. All lines are affected when it comes to the Rhine and Danube..Good luck..
I’m booked on a Rhine River Cruise with Viking for the end of Nov. I’ve been hearing about the low water levels and people being bused. Since this is my “bucket list” trip, I really don’t want to take a bus tour when I’ve signed up for a river cruise. I filled out 2 different contact forms on the Viking site and have yet to receive a reply. Those of you who have traveled in this region this month ~ how are the levels and how was your trip? Thank you. I just posted a comment above. My husband and I returned from s Rhine River cruise aboard the Viking ships Kvasir and Idi. We missed seeing several castles along the Middle Rhine, had port stops cancelled or shortened and lost a lot of time on buses and packing/unpacking for ship swaps. The river levels have been low for a while. They are not being honest with their customers. We received a letter last Monday from Crystal Cruise Lines informing us of the low water levels.We were scheduled to leave on Oct 25th on a river cruise from Vienna to Basel Switzerland. We were given three different options including cancelling with a full refund. Unfortunately after much consideration we decided to cancel. After reading some of the comments here I think we made the right decision. We were impressed that Crystal contacted us and gave us the options. Maybe next year we will try again. That’s impressive on Crystal’s part. Thanks for sharing and hope you get to go when the time is better. We just came back from an Avalon cruise from Budapest to Amsterdam Sept. 18 to Oct. 5th. We had received notification from Avalon approx a week before departure advising of possible changes and water level problems. However all went very well until we reached Cologne. Avalon handled the changes seamlessly. We bused to Amsterdam for the last two nights in a 5 star hotel, all expenses paid, and compensation of 100% for the last two days. No complaints, would certainly travel with Avalon again, great service, food excellent, spotless ship (The Passion) Cruise director Maria was amazing. Thanks for sharing Rod. Glad that Avalon handled it well. We are scheduled on Uniworld November 10 from Budapest to Amsterdam. We cannot do bus tours. Even if it started raining now, would boats be able to navigate? Although we took none of the cruise lines listed. We took a Rhine River Cruise with Avalon Waterways, between Sept 29th and Oct 6th, 2018, and were informed two days before we docked at Koblenz. They said we may have to trade ships between Rudesheim and Mainz. We had a small layover at Rudeshiem, and a determination would be made. If we had to trade ships, we would have to have our luggage ready by morning. We would be bused to two smaller ferry lines for the trip through the gorge. Fortunately the rain the day before and during the night, was enough to keep from grounding the ship. The Captain said, “We need between 2 to 3 meters from the current level, to safely pass. We will notify everyone by 7 am next morning”. We were notified departing Rudesheim, that the water levels had significantly increased and we would sail through. Our sister ship going northbound was also able to continue through to Amsterdam. I have nothing but admiration for Avalon and the Crew we had on Tranquility II. Nothing was kept secret, and we were always kept in touch by the Cruise Director, and the Captain. They also laid out the night before around 500-530 pm, what was in store for the next days activities. My two cents, in case you’d like to try another river cruise. I would use Avalon again, without question. And yes, regardless of the line or money spent. It is the carriers responsibility to plan and/or make amends. current Ama trips on Rhine are cancelled. Keep in touch with them! Our cruise was booked thru Untours. I have requested that our cruise be cancelled without penalty but that we keep the airline reservations. We have a weeks stay in Paris after the cruise. Thus we would do our own trip in Amstersdam and Basel taking the train to Paris. Untours said they will be contacting their AMA rep. A cruise company should never cancel or significantly change a cruise without enough notice that other plans can be made. It is quite common that pre and post cruise plans are in place and are affected by last min. changes. oh im so glad i found these comments. i go with Saga on a budapest to Vienna cruise on Thursday. i am going On thursday 25th and Saga wont tell us until Tuesday. but i certainly dont want to do a bus trip as i have been really looking forward to a riverboat cruise . if they offer a cancellation i will take it. i quess its not their fault. what a drag!!! i had tickets for an elo concert which i sold as i booked my holiday and now i wont have either .. i never expected a water problem we certainly dont have that in n IRELAND !!!! Our Riviera cruise from Budapest to Budapest started with really low water levels in Budapest on 5th October. Travelled as far as Linz upstream but downstream the cruise terminated in Bratislava. 3 hour bus journey each way if passengers wanted to visit Budapest and then a further 3 hour journey the next morning at an unearthly hour to catch flights. Spoiled the end of our holiday. Accept others were more seriously affected, but we specifically asked our TA to check with Riviera before we left UK that previous cruise itineraries had been achieved naturally or by bussing, hotel stays or switching ships. Don’t think they were totally honest. We would have liked the opportunity to re book. We were scheduled to leave Vienna to Basel on Oct.25th on the Crystal Ravel.We received an email from Crystal on Monday giving us three options,one was a reduced cruise of 7 days ,a 14 day cruise back and forth from Vienna to Passau or a cancellation with a complete refund. After much discussion and reading all these comments(thank you)we decided to unfortunately cancel. Kind of knocks the wind out of your sails when you are looking forward to getting away but we were happy with Crystal for giving us options. If anyone is on this cruise would love to hear some comments during or after their cruise. Wee have just finished our 16 day cruise from Budapest to Amsterdam, and we travelled with Gate1, on the Monarch Baroness. We hit very low water levels between Passau and Regensburg on the Danube, so the crew dumped all excess weight, and we sailed slowly through the night, scraping the bottom across sand and rocks occasionally (eek!). We had 10cm of clearance. Our ship was smaller and lighter than the Viking and Scenic ships, so we did see lots of passengers exiting their ships with all their luggage at Passau, presumably to travel by bus. Then we hit record low levels on the Rhine at Nuremberg. Gate1 transferred us all to a day cruiser ship to continue sailing for about 3 hours (and the day cruiser was large and comfortable, served meals and beverages) and then we transferred to Gate1s sister ship, the Monarch Queen, further up the Rhine. The ships are identical and we went straight into the same cabin numbers we were on the Baroness. From there we completed our cruise to Amsterdam. We were very impressed by Gate1 efforts not to disrupt our sailing, and they did wonderfully well. We didn’t miss any of our sightseeing tours and slept every night on the ships. Most importantly, we sailed every day. As far as we know, it is still dry with no substantial rain predicted , so I think as time goes on, I would think you would be better cancelling if you are on Viking or Scenic. We also saw Avalon stranded, and an Emerald ship. Passau is definitely an issue. You’re happy with Gate 1 in all cases? Hi, I am not cruising until next April on The Rhone River in France on Stella Rosa. Does anybody know anything about average water levels at that time of year on Rhone River? Rivercruiseinfo.com is a dead site! Do not use it! The water level reports are absolutely wrong! Any comments on how AMA Waterways did through this difficult, low water level period on the Danube. I know they are supposed to have boats that can navigate through lower levels than their competitors. The Amaserena from Vilshoven to Budapest could not proceed beyond Vienna. The line did a good job rescheduling and we chose to spend three days in Vienna on the ship. (A great place to be stranded) Bus to Budapest and we ended up hiring a private guide for a tour there. Disappointing, certainly, but I was pleasantly surprised to receive a letter of apology from Ama Waterways with a significant future cruise credit. They handled the situation in a very classy way. We just finished Budapest-to-Amsterdam on 10 October with Scenic; they told us we were their first boat to successfully make the entire trip since July. For example, we had to wait an extra day for a “wave” to raise water levels near Passau. With the extra day there, we docked downtown for shore excursions than moved to an industrial dock for the following day, which served as a base-of-operations for shore excursions via bus rather than docking in towns nearer the excursions. The bus excursions were 2 hours of driving time or less, so quite tolerable. The Rhine Gorge water levels were predicted to rise and did not, so we were within one day of having to switch boats and stay in a hotel in Nuremburg for 3 days as a base-of-operations for excursions while the 2nd boat came upstream to meet us. Scenic was very good about clarifying our options, which included an option to stay on the boat for an extra 3 days without excursions or move to the hotel to continue excursions, both with substantial credit offered for the change in itinerary. At the last minute, the crew decided to hurry the boat downstream to catch another “wave” in the Rhine gorge. I was really impressed by the extra effort that the entire crew went through to avoid having to go to a “plan B” or “plan C.” To lighten the boat for more clearance, they emptied the hot tub and waste tanks, and offloaded diesel and fresh water to just a limited supply, then moved the boat through the low-water section while passengers were away at a shore excursion. Really fantastic effort in my opinion. Bottom line: Buy trip insurance and be ready to be a flexible traveler. We got lucky and had a trip-of-a-lifetime, but we could have very easily gotten too worried about water levels and used our trip insurance to cancel. You always have the option of canceling at any time with viking as long as you buy insurance, if you dont buy insurance shame on you. We bought the insurance. What’s irritating is that we became aware – quite by accident – 2 months prior to our departure date about the low water levels and when I called, the Viking agent completely downplayed the situation and said if water levels remained as they were on the day I called (8/13/18), at most we would be bused around one lock. It later became apparent that was a serious misrepresentation of the water situation at that time. The reason I’m pointing this out is the insurance reimbursement is based on how far out you cancel. Had Viking been forthcoming about the situation, we may have cancelled sooner and received a more favorable reimbursement (percentage of vouchers versus refund). Either way, we are out of pocket the $1,400 cost of the insurance. And have a diminished opinion of Viking. You must be a shill for the company. Booked on an AMA cruise on November 1 from Nuremberg to Luxembourg. Sailing basically on the Main and Moselle Rivers, plus the Rhine Gorge. Any insight into the water conditions on these rivers? Any word on Emerald Danube cruises upcoming in October? I am a travel agent and just got word today that my client’s Oct 16-23 Budapest/Passau cruise was cancelled on Emerald. So upsetting. Thank you for sharing this with us Ginette. Thanks for the info. I am not on that particular cruise but another one coming up soon. I have not heard anything from Emerald so am assuming that we are good to go on the cruise. I will try to post status once we arrive… still hoping for some river cruising. We are into the first full day of our 8 day Danube cruise with Emerald. Information has been provided (finally) and we will not cruise the river until the final day, from Regensburg to Nuremberg. Two nights in a hotel in Vienna and the rest of the nights on the ships. But, there will be no cruising between any ports, so the ships have become fairly expensive hotels on the river. Our view isn’t even noteworthy. A refund package based on a number of factors is being offered but won’t really know details until end of trip as everything seems to be dependent upon some form of calculation related to elements of the trip missed. It is all contained in someone’s fine print. At least Emerald has a guarantee. Still, lots of disappointed people… understanding that there is no control over river levels, it is a continuing refrain from most cruises that communication is the biggest issue. I still have not received any form of official notification from Emerald other than what I have received today on the boat. They have 2 email addresses, a phone number, street address (which they require up front in order to be able to “communicate”. Not sure if anyone has had better luck with other companies, but even with Emerald there is variation… some people received hard copy, mail delivered letters before departure. Some received email and many, like me, received nothing. What is the criteria for selection in this regard? Did I not spend enough on my cruise? Next word on our October Danube Cruise with Emerald… left the tour when given the opportunity for a “full” refund. Chose not to do bus tours. “Full” refund = less than 1/3 of the amount paid for the trip. Refund is for the “cruise portion” only. Still waiting to hear why we never received notification of river levels prior to arriving on the ship while some others did. Still waiting to find out the criteria used for deciding on the refund amount. Not expecting anything in the way of communications since this has been the sore point throughout the whole experience. Be prepared at any point to lose your trip and much of your money. Trip insurance notwithstanding. Our group of 22 cruised on Viking August 4 Romantic Danube, Nuremberg to Budapest, and were only told by email the afternoon before our flight that water levels on Danube were low and we ‘may’ have to be bused to Passau to our Viking ship docked there instead. It was so disappointing since we talked so many friends and family into coming. We were bused many hours BACKWARDS to Regensberg and Nuremberg and then found we could not cruise to Budapest either–another long bus ride! Then a long early morning bus ride to Budapest airport for flight home. Our cruise was only two days, and our ports were in ugly industrial areas with so many ships docked there. We all had paid extra for french balconies, but because ships were stacked up by six across, we looked directly into other ships bedrooms, a few inches away! A complete waste of money. We hoped Viking would at least compensate for part of the balcony cost–but they said all they could do is give us 25% off a FUTURE cruise. We were so disappointed, we realize they cant help the low water levels but we could have been notified ahead of time or even an apology from Viking. We called customer service when we returned and lady was actually rude over phone. We have a different opinion of Viking. Paying extra for balconies is always iffy because all ships at some point will be stacked in the docking areas where that balcony will look into another ship. That happens no matter the water levels. We are leaving Sept 28th for a Viking River Cruise from Basel to Amsterdam and were informed that there are low water levels on the Rhine and that we are starting out on a different ship and will do a ship swap, they said 1 or 2 inches of water could make a difference, I look at it as an adventure and am sure Viking will do everything they can to make the trip enjoyable!! How was the trip? Love your positive attitude! The River Rhine being a perennial river with a catchment of 185,00 sq. km is usually very predictable. The Rhine’s two largest tributaries, The River Moselle and Main have been completely harnessed and in general do not cause much trouble. Extreme rainfall however in the entire Rhine catchment area over an extended (continuous) period of time could cause some flooding with occasional extremes such as August 2002 and June 2013 when the river cruise industry was disrupted for a few weeks. Flooding in the Rhine catchment mainly takes place during winter and early spring. The Danube Catchment being 800,000 sq. km is a bit more unpredictable and it is not completely harnessed by man. Plans to construct a number of barrages and accompanying locks have existed for a couple of decades to solve shipping challenges have gone down the drain after several lawsuits from the green parties who recently won. On average, small parts of the Danube cannot be navigated 60 days a year (mainly in winter months of January and February), this can be easily solved by just waiting behind a bridge during high water or at a ford during low water until you can sail through, sometimes a few hours, sometimes a day and that’s it. Nothing to worry about. The River Elbe has always been a very challenging river and notorious for low water and the industry has had some interesting challenges, therefore special ships equipped with paddle wheels have been built and are successful. Due to extreme heat throughout Europe this spring and summer we have had quite some challenges in the RMD Region (Rhine, Main, Danube and their tributaries). unforeseen and worse than the summer of 2003, when we had some challenges as well. Not a drop of rain throughout the RMD region for several months caused extreme low water on the Danube with not only the usual fords, becoming rather shallow, but also at unusual sections. This has created unexpected situations, thus given some serious headaches to the industry and its customers. A single ship swap with a one or two day disruption of the program is not a big deal, because on other itineraries a swap is a necessity when changing rivers. Thanks to the Main-Danube-Canal the Rhine and Danube Catchments have been connected since September 1992. The local water and shipping authorities display actual water levels at different sections and also do forecasts, but these have become rather unreliable, as they continuously have to correct them this year. Water after rain travels in “waves through” the river and this can be observed when checking the important water level gauges. It is a question of a few hours, sometimes 24 or more that the level is high enough to sail through. The Danube can at times rise/fall 3 or more metres in 24 hours. Now we have had a lot of rain in the catchment for the past weeks, which saturated the land again and extra rain will now be able to find its way to the river feeding a lot of shallow sections again. Nevertheless if rain doesn’t come the wave is gone again after 72 hours, a rather complicated situation to predict. The most challenging stretch of the Danube is between Regensburg and Passau where a natural part of the river is only fed by 3 sizeable rivers, The Altmühl joining the Danube as part of the Main-Danube-canal, The Naab, just before the Danube reaches Regensburg and the Isar, just past Deggendorf. I hope it helps you understand that the industry and all cruise lines are doing their utmost best to properly inform you about the situation on the rivers. This problem caused by nature is very expensive for the cruise lines as well. Let’s hope we can sing in the rain again, this fall. Just found this article Roland. We have read many comments from Viking travelers who are finding it very difficult, being bussed instead of cruising. This article is such an interesting explanation of the concept of river levels. As you know, we were on the last ship Jewel to get through the low water and left Amsterdam on 25th June 2018 just managing to scrape through to Budapest. I can understand passengers being upset at their trip being disrupted but the vagrancies of nature run riot with the best laid plans of tour directors. If you go on a river cruise, you have to be aware of the problems which may arise through no fault of the company. This year was exceptional throughout Europe with such dry weather causing havoc not only to the travel industry but with the commercial traffic, whose livelihood depends on the rivers. I hope people who have had their trip disrupted manage to read your article and thus can appreciate the problems that the cruise companies have had to contend with this year. Anybody have any current knowledge of Danube water levels?? We are leaving on our Viking Cruise next week. I’ve called Viking and though somewhat evasive, they say there has been some rain and they do not expect any disruptions at this point. I’m wondering how true this is?! Liz, I called twice and it was not until I challenged the second Viking person given the reviews I was reading AND posted such on the Viking facebook that they called me. The person was honest and did reflect what I had been reading. I would be very surprised if there are not disruptions. There is a section of the river that the boats CURRENTLY have not been able to go on. They have done some swapping of boats and they have been doing some busing to a port or two. What is not true is to simply say their itinerary is being kept because it leaves out the changes. We are going anyway (Oct. 6 from Nuremberg) and are ready to embrace the change. If I had not received that call I would have been very upset but now I am prepared. I had the exact same experience! After leaving a message on Facebook, I was contacted by Viking and given very honest and exact information. Just today we talk to someone else that told us, as of right now, things look good for no disruptions. My fingers are crossed!! See you soon!! got the viking email today listing all the ways our trip could be disrupted. From missed ports to boat swaps and busing. wow they are bad on pr! Their web site says little, the reality is probably a boat swap asnd some busing. going anyway but they risk us using another company in the future due to such behavior. Nice to have been prepared. Emerald did not send me anything but some on our cruise did receive notification. What I don’t understand is the levels of communication and variation in those levels based upon either some unknown criteria, overworked agents, or simple dis/misorgranization. We are at beginning of our tour and trying hard not to be too disappointed, but some preparatory information would have helped ease the initial let down. We are meant to be sailing Bucharest to Budapest with Viking on 18th Oct. Viking’s web site is saying everything is OK, but has antbody sailed this section of the Daube recently? We are still on our Budapest to Amsterdam “cruise”—on a bus from Rudesheim to Amsterdam. We have had numerous bus trips in lieu of sailing, a transfer from one ship to another, parts of cruise cancelled. It appears the Danube isn’t passable after Rudesheim. We just returned from Budapest yesterday. The Danube is extreme low and we did not see any river boats cruising. We were on an Avalon cruise and had to be bused from Vienna to Budapest. Maggie were you on Avalon’s Vista ? If so did you receive any apology or compensation? We traveled on Vista and lost half our River cruise travel which was really disappointing but I have only positive comments re the ships crew and staff as they were excellent. Too bad Management do not treat disappointed passengers with more respect and apologize and also voluntarily extend some form of compensation. Sounds like the government. “One part of me says this, another side of me says that” The worst decision is no decision. We had a 15-day river cruise from Budapest to Amsterdam that was supposed to leave on August 4, 2018 on Emerald Waterways. Because of the low water levels on the Danube we stayed in the hotel an extra day and then were bussed to Bratislava. We spent three nights on the river boat and were not able to get past Passau. Emerald told us we could not continue from there and gave us the options of flying home, continuing on route by bus, or making our own arrangements. Because of our travel plans we opted to continue by bus. We stayed in three different cities along our original route and then bussed most of the other sites. It was quite a disappointment but I was more displeased with the lack of information and planning exhibited by Emerald. They are promising a partial refund of $175 for the days we weren’t on the boat and a $500 credit on a future cruise. We have booked a Seine river cruise for Sept. 3-19, 2019, Paris to Normandy w/3nights Venice and 3 nights Rome on Avalon. Does anyone recommend “cancel for any reason” insurance? We’ve been reading a lot about water levels affecting river cruises, and must decide soon which level of insurance to purchase. It’s our first river cruise, and has been on our “bucket list” for years; as many have said in these posts, we aren’t looking for a bus trip. Any insight would be much appreciated! We sailed on Viking from BUD to Nuremberg, theoretically departing on 8/24. Low water levels on Danube forced ships to not pass between BUD and Vienna. Viking put us up in an excellent hotel on the Buda side for the first night instead of the ship. The next morning we proceeded with BUD excursions, then everyone rendezvoused for lunch on a riverboat restaurant, after which we were bussed to the ship approximately halfway to Vienna. Next 3 days were as scheduled. Night before we arrived in Passau an announcement was made that Passau was as far as the ship could proceed. Coaches were provided for shuttles to/from remaining cruise stops. Viking additionally added a day trip to Linz, which was a significantly shorter ride than was Nuremberg. Our post cruise plans prompted us and a bus load of other guests to leave the ship a night early to eliminate some bus travel. Again, Viking put us up in a first class hotel in Nuremberg, arranged for all meals and provided a crew person to stay there also to ensure everyone was well taken care of. -God controls the rain and there is nothing that Viking or any other ship companies can do to increase the river levels. -Viking did absolutely everything in their power to ensure guests still could enjoy a memorable Danube cruise. I cannot say enough for the professionalism of Viking River Cruise personnel. Oh, by the way, everything about our cruise, ambiance of the boat, cleanliness of the boat, quality of the dining, housekeeping, staff’s desire to meet everyone’s personnel needs, and finally the Bavarian accordion and guitar combo during the “German food dinner” playing Tina Turner’s Rolling on the River, made our cruise an exceptionally memorable experience. -We were notified a week or so prior to the cruise about low water levels and the potential impact upon our cruise, along with a commitment to providing a 25% credit for the cost of the cruise that’s could be applied to future river or ocean cruises. -Upon return home a follow up communication from Viking apologized for the disruption and increased the credit to 50%. -Suppose we could have explored utulizing our trip insurance to cancel the trip, but glad we didn’t. 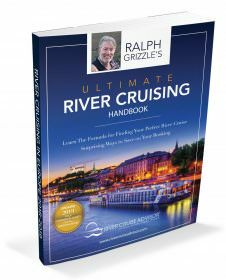 Lastly, we want to thank Ralph Grizzle for recommending the Danube to us for our first river cruise and also for recommending Cruise Specialists. They did a great job! Hi Ralph, in Poland now. As I have told you before and I am now repeating this to your listeners, we got caught in this mess a few years ago. We had another trip down the Elbe from Prague to Potsdam, which was canceled by Nicko Cruises because of low water levels. Instead, they offered us a trip on the Havel and Oder from Potsdam to Stralsrund. If we had refused, they would have mailed us all our money back that we had paid them for the trip. The German government insists that they take out insurance to cover this kind of problem and the problem is solved for the customer. Don’t plan on this with an American company. We decided to go and had a great time. They gave us the identical places on board that we had paid for, met some great people, Americans and Germans. This year was a hot one in Europe — in the 90s in Europe during the month of July so it was pretty obvious with the lack of rain and high temps, parts of some rivers would be having low water levels. We did do Crosi-Europe on the same trip I just described to your listeners in August of this year. The weather was a little cooler and there weren’t any water problems north of Berlin and into the Baltic. Another great trip with wonderful food and nice table mates. We were scheduled to do two cruises with Uniworld. The first was in Bordeaux, plenty of water in the French rivers. The second was scheduled for Aug 19, from Budapest to Bucharest. Two days before end of our first cruise, we got a message from our travel agent that the second cruise, which was to be our last due to my husband’s health issues was cancelled. Had booked a suite on the SS Beatrice, the ship we took on our first cruise. Since we were in France, we eventually took one of the options they offered. However, first I must say that this is when you rely on your travel agent to fight for you. She did, and we ended up in Provence on the Catherine. There were no suites available, but Uniworld offered us two level 1 cabins. We though this was fair. They also refunded our hotel stay in Budapest, 3 nights. I never thought the eastern Danube would have low water issues, and I don’t think Uniworld did either as they waited until the last minute to cancel. We are also getting a discount on a future cruise. This is when your company shows its true colors. Uniworld has always done the right thing by us. We could also have chosen a full refund, but since we were there, we decided to choose an alternative. It really messed up our flights, but I always get travel insurance. this time my travel agent suggested adding an Allianz flight insurance policy and I am glad I did. Put these on the ships Facebook page and demand a refund for the bus part. You did not sign up for a greyhound bus trip. It gets results! I did and it works. We were scheduled in two days (Sept 23) to pick up the Crystal Bach riverboat in Mainz Germany. Now pick up port has changed to Andernach. Info of changes thereafter are not forthcoming. Does anyone have further info on the Rhine situation, going north? I would also like to know the water levels of Rhine and Misel rivers. Cruising in a week. Thanks! We are due to travel on the Danube, Budapest to Budapest via Esztergom, Bratislava, Vienna, Melk, Durnstein starting 5th October. Having read some of the horror stories I emailed TA today to ask whether our cruise might be impacted. Was told current cruises were being completed to itinerary and only one cruise had been cancelled on 6th Sept. Can this be true? They didn’t say whether anyone had to change ship or be bussed between destinations to achieve the itinerary, so if there is anyone out there who has completed our cruise on a ship in the last week or so or can give updated info on the water levels I would be grateful. Well, we are supposed to sail Amsterdam to Budapest on 9/22. This is a once in a lifetime for us, my birthday and our 40th Anniversary. We are spending a great deal of money on a suite and air to celebrate. Contacting Viking gave no answer. They had a “volume” of questions. I have no idea what’s going to happen. We leave tomorrow 9/21. It’s wait and see, I guess! Has anyone taken the Grand Circle cruise down the Rhine recently? I’m concerned about my cruise on the Danube from October 1 thru 7, 2018. Based on comments about bussing instead of cruising and the inconvenience of it I’m considering canceling. I have insurance to cancel for any reason and wondering if any of you have information about getting full refund by using it. My wife and I are scheduled for Amd to Bp on Oct 12. It is becoming increasingly obvious there will be changed itinerary, ship swaps, bus travel in lieu of cruising, hotel stays, and other disruptions that will very likely spoil our 12 days of cruising. It has also become obvious that Viking is not stepping up and fully informing us and other passengers of the known low water levels, and probable “variations” they know we will be facing. A river cruise that becomes a bus tour is not just a variation, it’s fraud. It’s time for Viking to guarantee a full, uninterrupted cruise, or issue full refunds. Totally agree with you. Ours is really not a pleasant experience with several last minutes surprise arrangements. Viking on this business should have known, well prepared and communicate with the clients. Viking’s reputation is damaged. We leave on 10/23. In the same boat. I would rather cancel than have my river cruise trip of a lifetime turn into a bus tour with bag lunches and smelly toilets. Hi Gretchen, Are you on Viking Grand European tour. Bdp to Amsterdam? We were on the same scheduled cruise. We called office day before flying halfway around the world and demanded specific updated info. We were told 5 of 8 days on motorcoaches and hotels vs 8 days on the ship. We had reserved one of the two suite staterooms at the back of the boat and cancelled the trip. Maybe next year if the river is up. We leave on 10/27 from Nuremberg. Afraid it is turning into a bus tour. NOT GOOD. I’m 6’-5” tall and don’t fit in a bus!!! Has anyone demanded a refund from Viking? I know the contract is solid on there part but this is ridiculous. I wish an attorney would respond. Ours was in early August and Viking were decent from start to finish. Itinerary changes, buses, ship swap and drip feeding of information to keep people fooled all through the cruise. The funny thing was, so many people were so gullible until they realised we would be missing the last 2 stops and being bused to Amsterdam. Tell us what has happened! Hi! What did you do about your laundry needs? How about the Rhine? Any recent experiences? Booked in about 2 weeks … Amsterdam to Basel … Thanks! We did the Rhine & Moselle River Cruise (Avalon) June 23rd to July 5th and the Rivers (especially the Rhine) were rather high. We barely got under a couple of bridges. Hi James… which Rhine and Moselle cruise did you do on Avalon. We are hoping to book a similar trip Jun 2020 for our 50th anniversary. It’s a once in a lifetime for us, and concerned that we could end up on a bus. Can you give a few detains to your trip? Did you enjoy it? We are booked to cruise Budapest to Amsterdam with Scenic towards the end of September. So far no word from Scenic re possible changes, but I am concerned that we may be on a road trip and not a river cruise. Just finished Cruise with Scenic .. finished 3rd September. Changed boats twice . Was bussed two day between boats .. missed the Rhine gorge and other sections. Made most commitments re castles and city visits but had a lot ofbussing and this led to short free time in a lot of places. Scenic staff try hard to keep to itineraries but the river being low caused problems. The main complaint with all travellers is that the companies have known well in advance that the levels are impassable in some area but do not let you know until you arrive that there may be problems. They extracted a lot of money from customers but are reluctant to cancel even when they know in advance. Compensation is laughable. Great trip if all goes to plan but don’t expect the companies to compensate. Due to cruise with Viking on 2nd September Budapest to Nuremburg. Contacted Viking several times to voice my dismay at possible coach travel in place of boat. Viking are not willing to discuss and commit possible options and time is now running which I feel is just not good enough as we have paid river cruise price and not a coach tour price. Does anyone know what options Crystal Cruises has made through the September 17th cruise on the grand European from Amsterdam to Budapest? We are leaving for a pre-cruise trip to Prague on 8/29. Viking sent me an email on Friday 8/24. I spoke to my AAA travel agent and she said if we cancel, our insurance won’t pay anything. I agree with everyone else…a bus tour isn’t a river cruise!!! I’m booked along with 4 family with Viking Budapest to Amsterdam Oct 1 2018. One family member is 88. Does anyone know it this trip is still worth it and how many days of cruising is now a bus ride ? Hi Harold, we booked on this cruise also. I have been concerned also. I have been checking the weather each day and there has been some rain. Viking has an update on their web page to say they expect business as usual in a couple of weeks. we are also on the same cruise. There is a web page that indicates water levels for all rivers in Europe. All levels look at this time to be normal. The concern we have is are we getting factual info from Viking or are they waiting until it is too late to notify passengers?? We did not sign up for a bus tour and quite frankly this “bait and switch” is not good business for a reputable company like Viking. Ken-Have you gotten any updates. We’re on Viking Danube Waltz Cruise on October 14, but we are leaving for pre-cruise on October 9th. Any updates would be appreciated. We start our cruise on Sept 1-Nuremberg to Budapest. I know Viking has no control over water levels, but they do have control over cancelling instead of putting customers through hellish bus trips when they looked forward to the river cruise of a lifetime. I am actually dreading going, but what choice do we have? We will be on the same trip with you.l Very concerned about what they are actually going to give us. Rosanne. I am scheduled for the return trip Budapest to Nuremberg the week after your trip. Please let me know what you experience.Not that I can do anything about my trip at this point. I will try to keep you posted. We are going on the same cruise next week with Viking. Please let us know how it is progressing. We would be most appreciative. Booked on the Avalon Budapest to Nuremberg cruise August 10 through 17. Received word that Danube was closed at Budapest and above Passau at about 10pm the night before departing to Budapest. Bused from Budapest to Karamov, cruised to Passau. Bused from Passau to Regensburg and then to Nuremberg. Cruise part was okay. Avalon knew river was closed but waited until very last minute to inform customers. Avalon cannot control the river conditions but should inform customers with sufficient lead time to make reasonable decisions. Had a similar experience with an Avalon cruise from Budapest to Amsterdam (WBA 0907) starting Sep 8th. The first 7 days of the cruise were superb- great cabin, great meals, everything as promised and expected. Then on day 8 we were abruptly told to pack up and abandon ship as the cruise had now become a bus tour because the water level was too low to continue. The problem with this was that Avalon must have known that there was a better than 95% chance of the cruise being abandoned as there had been no rain in the region since April, and several previous cruises had been cancelled or curtailed. They shoud have informed us of this strong possibility BEFORE embarking us in Budapest and given us the opportunity of bailing out at that stage, with a full refund, which we would have taken. Terminating the cruise at Vilshoven, a dot on the map, made it impossible for us to make alternative arrangements, so most of us had to stay with the bus tour.Then followed 7 days of hell- hours spent on buses stuck on the autobahn, accommodated in third-rate hotels, in some cases bare floorboards, minimal furniture (one easy chair in a double bedroom), single beds pushed together which we had to make up ourselves, no tea or coffee faciities) queuing in dining rooms as in a worker’s canteen for almost inedible food, and in four towns given a few Euros and told to make our own lunch arrangements. What a contrast with the sit-down meal service on the ship, with wine with every meal and tea or coffee whenever we wanted it. To compensate for this fiasco, Avalon made the generous offer of a 50% refund for every night we were off the ship, and a 10% discount on any future Avalon cruise we might take in the next 2 years (interesting to know how many of our fellow passengers will take that up!) The moral of this is if anyone is considering a European cruise with Avalon, make sure you enquire BEFORE EMBARKING whether they guarantee the cruise will be completed, and if this is not forthcoming, don’t go, otherwise you could end up doing a third-rate bus tour with one of Avalon’s partners such as Cosmos. We just got back from a Vantage 15 day river cruise from Mainz to Budapest. We only got to cruise 3 days and got bussed the rest. Not a good experience at all. This was a C – bus trip instead of a A grade river cruise. No word yet on compensation. We boarded the ship and did not move for 3 days then only on the Main canal. No Rhine or Danube at all. We were due to fly out to Budapest on 17/08/2018 to join our cruise ship,but we were informed the day before it had been cancelled !! The full amount of our holiday was refunded back into our account within a day.Just had to send a request for our prepaid airport car parking.We could go in October but I am not going to risk it !! June, please share which line you were on. Thanks. Hi, we were travelling with Riviera Travel . Our Budapest to Black Sea Riviera cruise 30th August was cancelled less than 24 hours before check in time, by phone call. On a web site re river levels, we have since read that they knew on 22nd August that river was in a very low water state. It would have been better if they had put us on cancellation standby, at that time, but, it was a massive shock. All bags packed ready to go next morning. Compensation received, full refund, but, special 15 day holiday for husbands 70th…..gone, we know they can’t help depth of river, it’s the short notice that’s not good. Keep telling ourselves that our group of 4 are all ok, worse things happen but, very disappointed . We were also booked on that same cruise. We were actually on our way to overnight in London when the call came through! With a full refund plus expenses including baggage man and £500 off two shorter river cruises already booked with them, we feel Riviera dealt very fairly and promptly with us. Our concern is – did the fact that our original boat Oscar Wilde which was moved from Budapest to go up river a few days before, then being replaced by Thomas Hardy – the boat which was listed to be used on the September 2nd departure have a bearing on this? Was there a problem finding another boat for the September 2nd departure resulting in our cruise being the sacrificial lamb? Other companies were actually sailing on that stretch at the time of our departure. I accept we will never know! Hi June, we were due to join ship 30/08/18 Phone call..cancelled less than 24 hours before flight. We were still trying to find out when our refund would be in our accounts nothing in after a week, ridiculous…. two couples… Took over a week, by bank transfer, ridiculous, we were worried they had gone into administration, was over £12,000 for the four of us. It was paid in after a week. They knew a good week before it was cancelled that rivers were low. We needed refund back in bank to rebook a holiday. Low river levels not their fault, but……could have put us on a pre warning…. Thank goodness we were at home, not in a hotel waiting for flight or on Euro train. We sail on Friday 24 August, vilshofen to Budapest, has anyone got up to date info on water levels please? We have just had our cruise from Budapest to Cologne curtailed just north of Passau and we have been flown home. The Danube between Passau and Regensburg was too shallow for our ship. It was supposed to be a two week cruise and we only cruised for 6 days. We have been told we will get compensation but we have no idea how much at the moment. Sandra, was this the Charles Dickens? If so who told you about the 75% compensation? Sandra, what cruise line were you on? I am currently on a cruise from Amsterdam to Budapest using the Travelmarvel ships. We have been lucky in that we have been able to swap ships from the Diamond to the Jewel. As there is no water near Nuremberg (not sure of the exact place) we had a 4 hour bus trip to pass the region near here that had in fact no water. Crew have told us this is the fourth time they have had to change ships to continue their cruises. Some more expensive cruise lines are busing instead of cruising at least half of the way. All the best, happy cruising not busing. We are traveling Viking October 12 leaving from Budapest to Nuremberg and received information that Budapest has closed its port, people are being bused for the whole trip. Has anyone received credits if cruising the river is not possible? Did Viking provide the information? What sources? Anything about the Rhine water levels? Information received from the Facebook page VIKING RIVER & OCEAN CRUISES FRIENDS. Great FB page! Lots of current information. Thanks Carol. We are booked Budapest to Amsterdam Sep 14 to Sep 28. We will be in Budapest a few days prior to sailing date. We have tried to get information from Viking about disruption to cruises but no information is being shared. Will try the FB page but would welcome advice as to what we should do. Tripnof a lifetime is not a bus tour! We were just cancelled. Crystal Cruise Bud to Amsterdam leaving Aug 16, 2018. Bummer. Just got through the same cruise with the aid of a ship change and following buses . Crew excellent but does not make up for a holiday of a life time gone terribly wrong. Surely Scenic new of the low snow melt coming via Switzerland. Money via satisfaction ie the usual component for profit at any cost…. Which line were you on ? Lead time did they give you? We were notified on the 7th for the cruise that was to begin on the 16th. In our case we did our own flight arrangements and were already in Europe when we were notified. I am hearing the water levels are down in some stretches of our Viking cruise Amsterdam to Budapest, October 12, 2018 that may result in a cancellation or changed itinerary. Can you advise? We just did Viking Bud to Ams, arriving in Ams on Aug 5. Had a ship change half way through and only lost the final Saturday to bus trips. Another heat wave on its way, they needed to position their ships along Rhine & Danube so they aren’t all stuck at one end. Hopefully by Oct levels will be much better. I talked to someone at Viking and pressed her for information about river water levels for the past week. She admitted to interruptions due to low water levels. Since we still had a month to go before our cruise we cancelled and got a 50% refund. I sure wish I had known about your website BEFORE our “river cruise” of this month. First half was great; second half was all by bus and I would give it a C- grade! I am scheduled to sail he danube from Budapest to Amsterdam in a week. which cruise were you on? was the second part of the cruise all bus and no ship?? Have you gone on your cruise yet? We go in two weeks. Are we going to be bused most of the way? Fran, we are scheduled on a Viking cruise beginning Aug 22nd. Were you contacted by your cruise line before the cruise began about the change in plans? And did your cruise line offer any sort of compensation for the second half bus tour? We are trying to decide if we want to cancel at this point…..
Oh my!we go on danube from budapest to nuremburg oct 19 so i am wondering just how much notice viking will give us if they have to cancel OR do they spring silly bus tours at the 11th hour just to avoid refunding the tour. It will requre a lot of precipitation to renew parts of Danube. If they are at all like all of the other companies, you won’t hear a word until the last minute… or in our case, never. We go on to the cruise ship and that was the first we heard. We are stuck in Budapest right now and all up and down the river, every company is bussing and hotelling with a few nights spent on the ship, but no cruising. The Danube is really low. If you can get out now, DO IT! I would have a week ago if only I had been alerted. We were scheduled on the Viking Skadi Grand European Budapest to Amsterdam 10/5/18 through 10/20/18. First time cruisers, celebrating our 40th anniversary. We cancelled 10/3/18 (fortunately we had trip insurance but still took a $1,400 hit even with that) and after reading your post, I’m glad we did. The first of August was when we first heard about the low water levels (on a friends Facebook post) and so we called Viking on 8/13 and the rep seriously downplayed the situation. Then when we got the email from Viking two days before our scheduled departure telling us we were likely to be bused, we called and Viking was willing to do absolutely nothing for us. We agonized another day before cancelling. I agree that the water levels are beyond their control but Viking has otherwise handled the situation quite poorly. We are scheduled for the same trip next October and I am getting this early! I wondered if you could share with me what trip insurance you had. I can’t find any language in any of the policies I have looked at so any info would be much appreciated. Our travel agent set it up through http://www.tripmate.com It’s not cheap – $719 per person – but it covered cancel-for-any-reason. Hope that helps! Thank you Diana. We are looking at this company to include in a broader piece about insurance. Appreciate you bringing it to our attention. Wondering what to do / I did buy trip insurance! False. No rain anywhere and none in the forecast. No ships were sailing and everyone we met at the airport today indicated the same. They got from Amsterdam to Regensberg and then all busing to Budapest. Lots of disappointment on the rivers this year. Maybe a rain miracle will happen but not looking good. Adding to what I said before, the weather forecast in the Danube river basin has some rain starting next week. Good luck in your decision making. I hope you get better information that will help with your decision making than we got. Companies have been sued successfully for not providing relevant info in a timely manner. We left the tour. They were bussing from Budapest to Vienna, two nights in hotel then bus to Regensburg. Ship swap there but still no sailing. Ship as hotel and then bussing to destinations then back to ship. Yuck. That’s why we left. Thank you for the update! WOW what a disappointment!! We were set to leave tomorrow 10/20 for pre-trip to Prague before sailing on the Viking Danube Waltz. I was aware of the drought situation on the Danube and have been following it. I contacted Costco Travel a few weeks ago for them to check the status with Viking and was advised that “all was well.” We were then notified by Viking on 10/16 that the itinerary was going to be “modified’ with ship swaps / potential hotels / bus trips. After several phone calls to Costco Travel and much online research (including finding this blog!) we opted to cancel. We are fortunate to have ‘cancel for any reason’ trip insurance. Yes we will be out the premium, but it is far worth it rather than having our luxury river cruise that we have planned for the past 2 years turn into a bus / hotel trip and not a cruise at all. On a side note, we hired a private guide for the post-trip in Budapest and she informed me that we made a very “wise decision” to cancel. Her husband drives buses for the cruise companies and they he is having to go past Vienna to pick up passengers to bring back to Budapest! Yes. A wise decision indeed. Good for you. It is a tough choice but you can now plan to cruise another day. I guess the bus companies can be happy this year. Would you mind telling me from what company did you purchase your travel insurance? Hello Martha. We have the TripMate insurance policy we purchased at the time we booked our trip with Costco / Viking. It doesn’t guarantee we will get our money back, but it will be either that or a voucher for another cruise to be used within a year. We submitted the claim on Friday and are awaiting a response. Was a fairly easy process – mostly done online. We are scheduled for the same trip next October and I am getting nervous already ! I wonder if you could share with me what trip insurance you had. I can’t find any language that would cover this in any of the policies I have looked at so any info would be much appreciated. In my opinion Viking has been horrible about truthfully communicating the situation to customers. I saw another recent post that said a ship hasn’t sailed out of Budapest in 3 months. I’ll bet someone at Viking made a calculated decision that it would be better to downplay the situation rather than be truthful with customers. I see customers of other cruise lines saying they were offered a full refund for a future cruise. Now that would be a cruise line I’d consider for future business. Our friends are on that cruise now heading south to Budapest and our on their 2nd ship swap in Germany. Just returned from a 14 day Grand Circle Cruise, (Great Rivers of Europe) Vienna to Amsterdam. We had 2 nights delay and were given accommodations at the Hotel Regina in Vienna with 3 great program directors on the front end with a short bus trip to Regensburg where we boarded the MS Harmony on the 2nd day of schedule. We cruised 10 days to Frankfort visiting the quaint towns along the way as planned. . We had a great local day trip on the Rhine to see the castles in the area of lowest water to navigate. We experienced wonderful service from the ships crew and our 3 very professional program directors. The longest bus trip was from Frankfort to Amsterdam (about 4 Hours). Where we stayed at the Hilton Doubletree in the heart of Amsterdam. Grand Circle really made our trip worth while even with the two low water areas. Take your next River Cruise with Grand Circle. You won’t be disappointed!!! How was river between Passau GE to Budapest? We just had a nightmare Viking cruise Budapest to Amsterdam. It included sailing on THREE different boats, wasting cruise time on buses to the next boat, horrible flight arrangements to cruise and then not being “in the system” at the airport on the way home. That was both in Amsterdam and Atlanta. If not for some very nice and professional airline employees, we’d still be trying to find our way home. The final straw was receiving an email today from Viking. They say they will give us 50% off our next cruise…. AS IF we would book another. And by the way, we booked this cruise during the half off sale. In other words, they are giving us NOTHING. They keep our $20,000 and we did not get what we paid for. We will be cursing the Elbe in Sept. Anyone cruise that river lately?